From where I’m sitting, you appear not to have understood Germany’s energy plan, which centres on ramping up and rolling out as much renewable energy as possible. How does having strong renewable energy ambition sit with commissioning new coal power plants ? Well, as you probably know, the wind does not always blow and the sun does not always shine – hence back up is required. Nuclear power cannot back up wind power or solar power because it is not very flexible. Coal and gas are easily stored, and coal and gas power plants can be kept awaiting use as and when required by renewable lulls. There is no point in fitting Carbon Capture (and eventually Storage) to coal fired power plants if they’re only going to be used for occasional wind back up – too expensive. And the tests are showing problems. And even though it’s claimed that CCS can take away 90% of the emissions, it’s more like 85% because CCS uses more coal fuel. The amount of time that coal and gas plants will be in use when renewable energy is fully developed in Gemany will be days per year in total. So in 20 years time when they’ve built all their wind and solar, they get to meet their carbon targets and still have operational coal and gas plant for when necessary. How is it that you’ve missed this central plank of their policy ? On the one hand, I could be asked to excuse this lapse of reasoning on your part – as far as I know you haven’t trained as an energy engineer, so how could you be expected to understand load balancing and load following in the real world ? On the other hand, you’ve just written a book extolling the virtue of nuclear engineering, in effect dismissing the sensible decisions that Germany and other countries have taken, so I cannot let this pass by without commenting. Sorry to report it, but you’ve just made it into my Little Book of The World’s Most Annoying Men because you appear to have no idea about the pitfalls of nuclear power, you do not seem to understand other approaches to the energy crisis; and in addition, you have built a generalist argument concocted from stereotypes to make the green movement the punch bag for your position. When I read a similar irrational rant in Anthony Giddens’ book “The Politics of Climate Change”, I became so angry, my reptile-inherited brain took over, and I threw the book across the room. Why, I ask myself, are you following in Giddens’ footsteps and becoming so reactionary ? Are you adopting the position of George Monbiot, who seems to be evolving into a curmudgeon ? I shall not be buying your new book, because your arguments are, to my mind, faulty. Curtis correctly identifies mismanagement as being the root cause of problems in the nuclear power industry – a mismanagement of information, dismissiveness of whistleblowing, and a dangerous overreach of technological ambition. Even so, there is a need to improve cheap methods of energy storage – and one of the simplest ways to increase capacity in this area is to produce Renewable Gas – which can be stored as easily as Natural Gas. Carbon dioxide is not the only greenhouse gas, although it’s the one most scientists worry about on the long term scale. Its diversion out of deep storage into the active global carbon cycle is causing global warming, and that, the evidence strongly shows, is causing widespread and disruptive climate change. But in short timeframes, methane is the gas on everybody’s worried lips. The sources of methane are affected by global warming, and methane emissions cause strong global warming in the short term, so it’s a positively augmenting feedback, self-amplifying, and causing grave concern in many environmental policy seminars. People often point the finger at the digestive systems of ruminant livestock when they want to pinpoint a scapegoat for rising methane emissions, but they should perhaps look closer to their own bathrooms and kitchens and their underfloor gas pipelines. Today’s publication of the UK Government Committee on Climate Change’s “The Renewable Energy Review” report seems to me to contain some fudge on the cost of nuclear power. Almost everybody agrees that the current cost of generating nuclear power from existing reactors and plant is reasonable. There are questions about how much, exactly, it’s going to cost to decommission ageing reactors as they become dangerous, and there are also questions about how much it’s really, really going to cost to safely “dispose” of the radioactive waste from over 50 years of nuclear electrical generation. Even so, the operations and maintenance costs, the “O&M” costs of keeping nuclear power stations ticking over is fairly reasonable – unless there are unplanned “outages”, or radioactive accidents, or problems with the price of uranium fuel…happily, these added burdens can be kept off the balance sheets for the most part. However, it is in projecting the real costs of new nuclear power, from shiny, spanking, new glistening, glowing concrete reactors, that deep and discomforting questions arise, and the CCC report, I think, I’m sorry to say, fudges the issue. Twenty-five years ago today, Reactor Four at the Chernobyl Nuclear Power Plant ruptured, and explosions sent highly toxic and radioactive material up into the atmosphere. In the light of the Fukushima Dai-ichi Multiple Nuclear Accident in Japan, and the setting of an official exclusion zone, it is important to re-consider whether the low-risk-of-high-damage nuclear power technology should continue to be used in action taken against low-risk-of-high-damage Climate Change. The central lesson of both Chernobyl and Fukushima is that over time, engineering systems degrade, constructions rust and crumble, human operations become slack, and small chances can add up to have big consequences. Outside the usual political and media circles, questions are being asked. Why has the United Nations sanctioned military engagement in Libya in the form of UN Security Council Resolution 1973 ? Why the heavy firepower here, in Libya, when the ostensible rationale for intervention was only to implement a No-Fly Zone ? Why not gloibal military action elsewhere in the Middle East North Africa (MENA) arena where there are other despots making life unpleasant or endable for their citizens ? I present to you two possible futures for Libya, both of which will require extensive cooperation with foreign corporate and political players, something that Muammar Abu Minyar al-Gaddafi (or Qaddafi) threatens, or rather, depending on various news reports, “threatened”. In a carbon-constrained world Natural Gas is a boon – it has roughly half the carbon dioxide emissions of coal when burned to produce steam to generate electricity. Any country that’s got Natural Gas, especially good quality Natural Gas that doesn’t have to be hydraulically “fractured” from rock strata, is a country we will learn to love and trade on significantly generous terms with. Production in the country has taken a hit due to the fighting, but order should soon be restored. Clearly, long-term stability in Libya, with unhindered, inexpensive access to the country’s oil and gas resources is an important part of the national security interests of many Western democracies. Let’s face the facts here – massive new energy projects in North Africa will be financed and developed through large multinational, transnational corporations, companies who have contributed to the economic slavery of Africa for, let’s approximate here, centuries. What guarantees can the Maghreb have that this is not a further land grab on Africa’s potential ? In addition, the recent social and political volatility in the Middle East North Africa region could jeopardise the noble plans of the European Union to reach out in energy partnership. Hang on. Wait a minute. Is the wave of uprisings across the Middle East and North Africa connected in any way to the interests of oil and gas companies who want Future #1 to prevail for the whole region, not just Libya ? American companies have been so keen to sell nuclear electricity projects to Saudi Arabia and others around the Arabian Gulf – but has this been encouraged from the high-ups to keep the Arabs off the scent of Renewable Energy ? Forget nuclear power – it’s expensive and awkward. Iran only pursues civilian nuclear power to irritate the United States Government. A solar Arabia could give the Middle East and North Africa a second generation of being the energy princes of the world. I suspect they will go for this in a big way very shortly, uprisings or no uprisings. Why ? Two little words – Fukushima Daiichi. So there we have it – two entirely probable, slightly competing, futures being mapped out for Libya by the big guns of NATO (a euphemism for the USA). 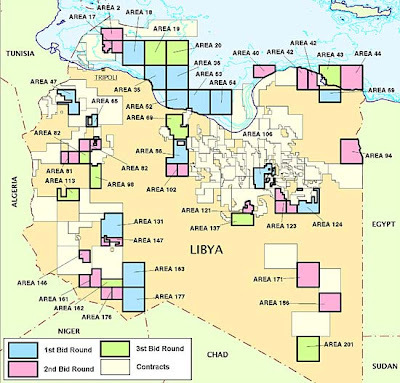 If Libya is split into two countries, the fossil fuel Future #1 will be likely applied to East Libya, and the desert solar Future #2 will be foisted on West Libya. Continued interference in the country is a certainty. Who Planned Pipeline Attack ? An unidentified group has taken advantage of all the turmoil in Egypt, gone undercover, and attacked a gas pipeline, which means that supplies to politically moderate Jordan (and the more hardline Syria) will be cut off. Who planned this ? It’s probably too early to say, but I can think of several possible answers to the question, and none of them are pretty. Posted on February 5, 2011 February 6, 2011 Author JoCategories Advancing Africa, Be Prepared, Big Picture, Burning Money, Conflict of Interest, Disturbing Trends, Divide & Rule, Economic Implosion, Energy Change, Energy Insecurity, Financiers of the Apocalypse, Fossilised Fuels, Money Sings, Peace not War, Political Nightmare, Resource Curse, Screaming Panic, Social Change, Social ChaosLeave a comment on Who Planned Pipeline Attack ?